Since October 2017, users have had the option of trying out the new update to Google Calendar. On February 28, 2018, Google Calendar will have an automatic update that will affect all Google (G Suite) users, including UCA accounts. This article lists the most notable changes and new features that UCA employees and students can expect in this Google Calendar update. For more information, see the full list of features on Google’s website. Interface refresh – As a whole, you’ll notice the redesigned interface. 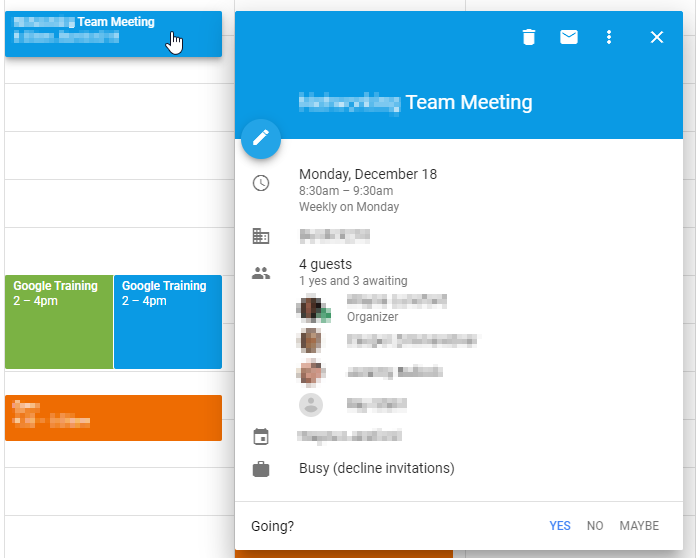 While most of the tools and features are still present, the updated version of Google Calendar looks similarly to the app version for mobile phones. Color and density options – As part of the updated interface’s default settings, the colors throughout the application are brighter (called the “Modern” color scheme), and the new version’s elements change their width and height dynamically to fit the size of the window (called the “Responsive” setting). 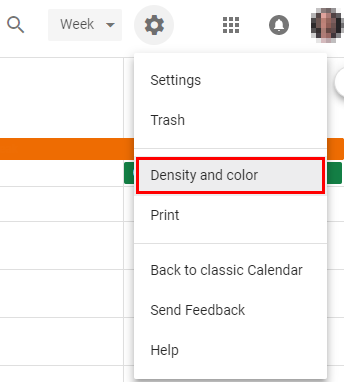 However, you can change these settings at any time using the Density and color setting. Create event button – The button to create a new event is now in the bottom-right corner of the screen. 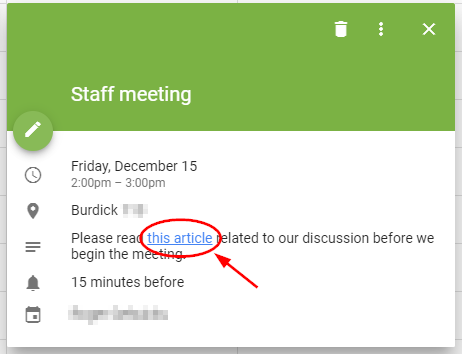 It functions exactly the same as Google Calendar’s previous Create button. You can still click anywhere on your calendar to create an event for that time, also. Event information – When you click an event on your calendar, you can quickly see the main information about it (event title, attendees, location, time and date, etc.) without having to exit the main calendar screen. Hyperlinks in event descriptions – Along with attachments, you can now include links to websites and resources within event descriptions. Drop-down menus for calendars – The new version of Calendar allows to simply click the X to unsubscribe from a calendar; all other drop-down options are available by clicking the three-dots button. Day-view calendar comparisons – When your calendar is set to Day view, you can see several calendars side-by-side to compare schedules. Go to Google’s support webpage for an example. Updated Settings screen – The Settings screen looks different in this new version, but it is more organized and allows you to access settings for every calendar from the same screen. To access settings, click the gear icon in the upper-right corner of the screen, and then click Settings. If you are using the old version of Google Calendar and want to start using the 2018 update, follow these steps. Go to Google Calendar through myUCA. In the top right corner of the screen, click Use new Calendar. 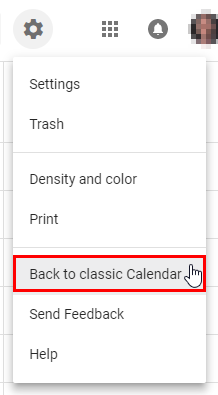 To go back to the old Calendar, click the gear icon (Settings) and then click Back to classic Calendar. Note that you will no longer have this option when the update is permanent for all users on and after February 28, 2018.